Superstar Rajinikanth had indirectly hinted that he is contemplating a career in politics. Rajinikanth, who spoke with fans last week, signalled that he is considering a political career. Chennai: Members of a fringe pro-Tamil group burnt an effigy of actor Rajinikanth, opposing his entry into politics. With the 'Tamizhar Munnetra Padai' planning to picket the actor's house at Poes Garden, security was stepped up there. The slogan-raising activists burnt an effigy of the actor at the busy Cathedral Road, police said, adding that scores of members of the group were detained. 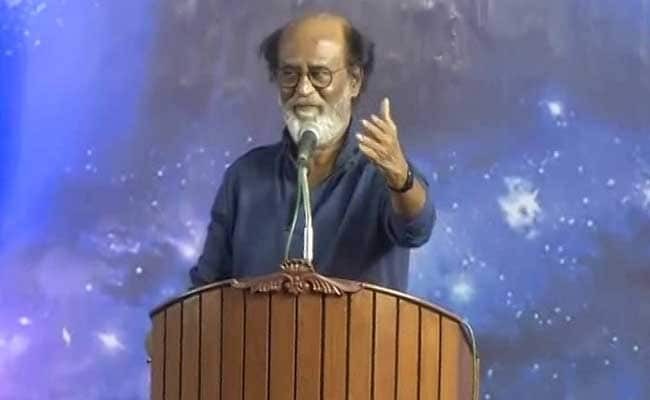 The activists raised slogans against Rajinikanth's possible entry into politics, an issue which has gained steam following his hints last week that he could take the plunge. The actor's Kannada origins are often a focal point of discussion in Tamil Nadu, with pro-Tamil groups raising the pitch whenever the Cauvery river water sharing dispute between Tamil Nadu and Karnataka escalates. The 'Kabali' star had, however, last week asserted his Tamil identity, saying his native place was a village in Krishnagiri district in Tamil Nadu. "Naan pachai Tamizhan (I am a pure Tamil)....if you ask me to get out and throw me away, I will land only in the Himalayas (which he frequents) and not in any other state," he had said. Meanwhile, Rajinikanth, who met his fans and clicked pictures with them last week, today posed for photographs with the family members of his staff and "close friends," sources close to the veteran star said.